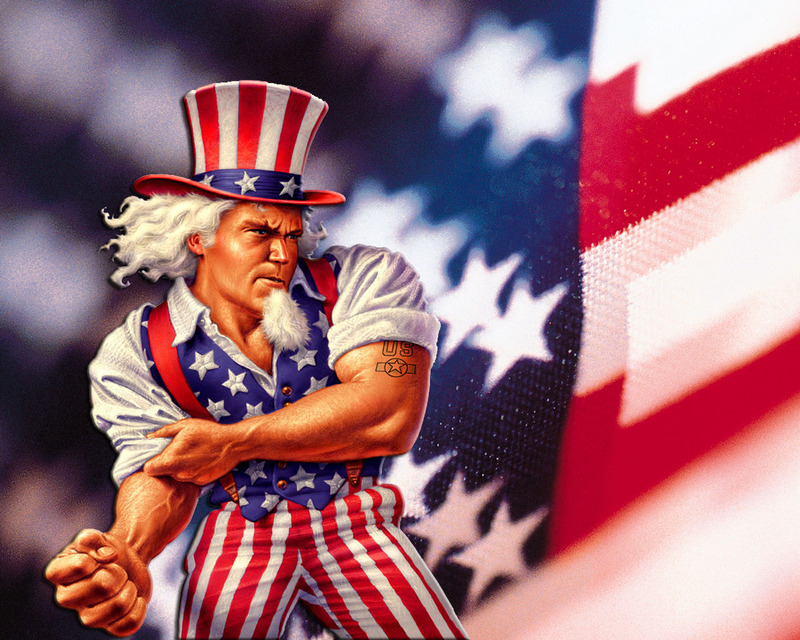 There is a difference between being “anti-government” and standing against crime in government. 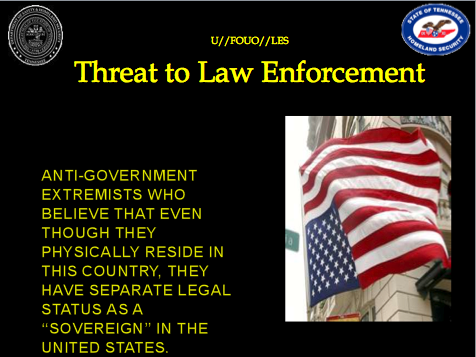 All of what’s reported here began with bringing and attempting to advance a charge against resident OBAMA for Treason in March 2009. 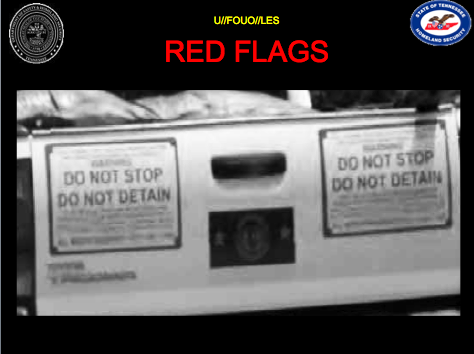 In response Obama, Holder, Napolitano and Mueller set out to first blur and then erase the difference between people genuinely and sincerely fighting outlawry in government and those who are vicious criminals. 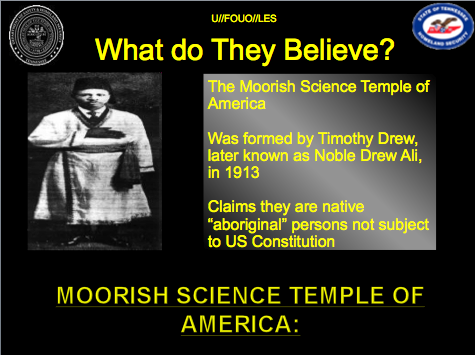 The power point presentation is made available here of the first time in it’s entirety on the Internet. 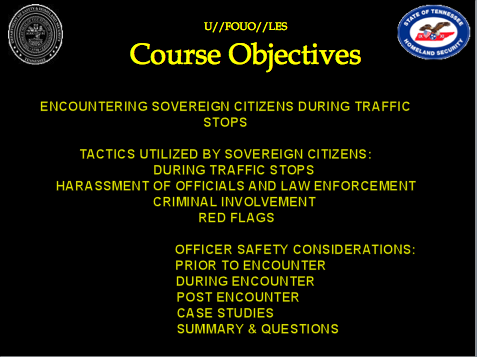 This presentation is part of a training course being used in one variation or another to train local, state and federal law enforcement officials around the country. 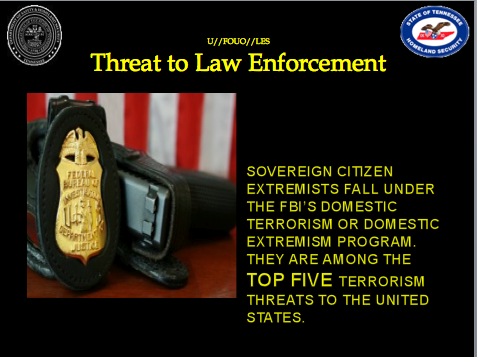 The mission of the “Sovereign Citizen,” or “Domestic Terrorist” campaign is to put down people who seek peaceful redress from an oppressive, overreaching and tyrannical government. 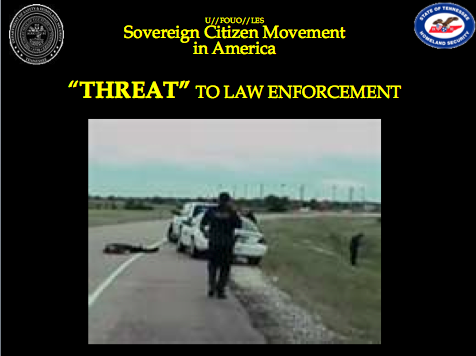 Obama’s training program equates ordinary, peaceful and law abiding citizens with the likes of Timothy McVeigh, or Terry Nichols or the young 16-year old Joseph Kane who shot two policemen dead in May 2010. Obama and his team are doing all they can to destroy any one who stands up to defend the U.S. Constitution or who stands against Obama’s Treason and lesser included offenses. 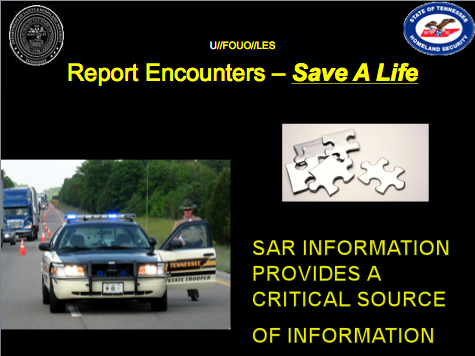 The power point presentation and talking points .pdf record come from a CD that holds twenty-three files for use in the training curriculum. 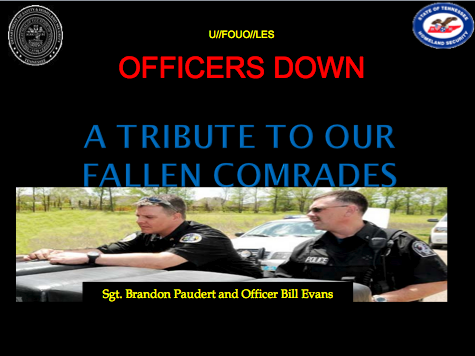 The CD was leaked to the public by an individual extremely concerned about how and what law enforcement is up to behind our backs. 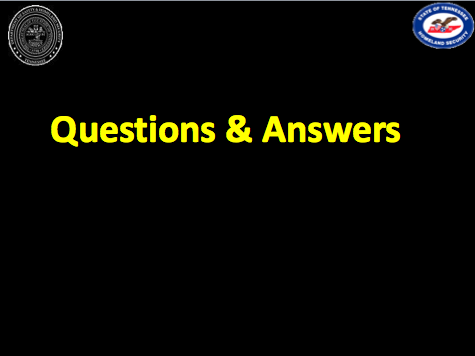 Notes in black underneath the slides are the same as those embedded in the power point package. Notes in red are mine. 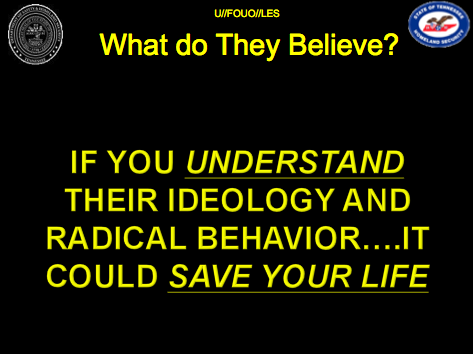 Programs Hitler used against Germans in the late ‘1930s and early ‘194os are the same programs Obama is using today against Americans. 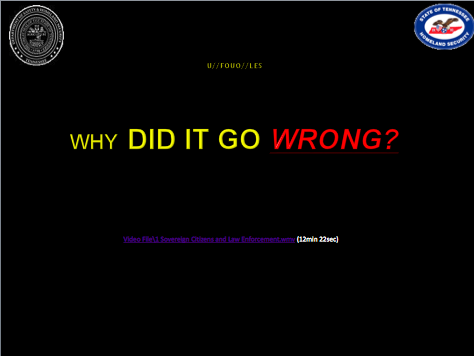 To condemn and quash legitimate public reaction to tyrannical dictatorship. 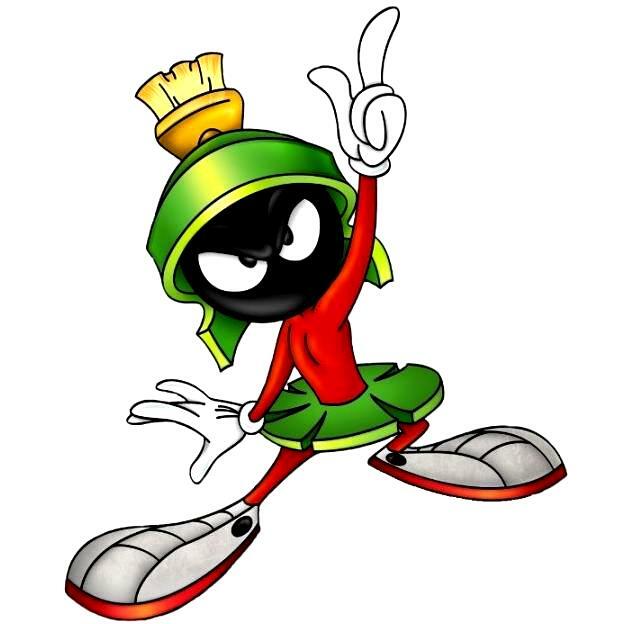 JAG HUNTER posting on the tyranny of the Fusion Centers: Click here. 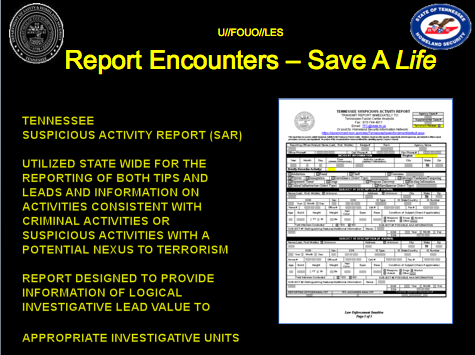 Direct link regarding the Senate subcommittee report released on 12 October 2012: Click here. 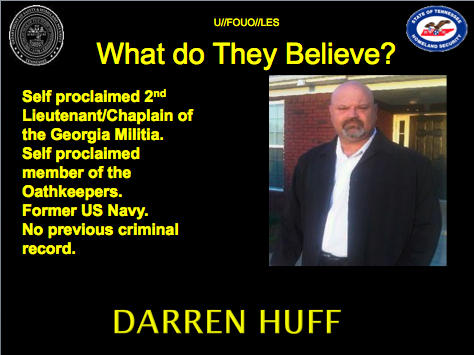 For the earlier JAG HUNTER posting on Darren Huff: CLICK HERE. 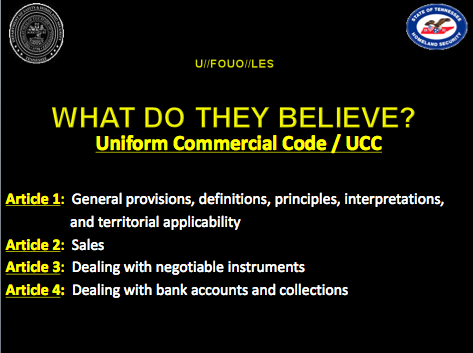 Slide #6: As a result, they believe they don’t have to answer to any government authority, including courts, taxing entities, motor vehicle departments, or law enforcement. 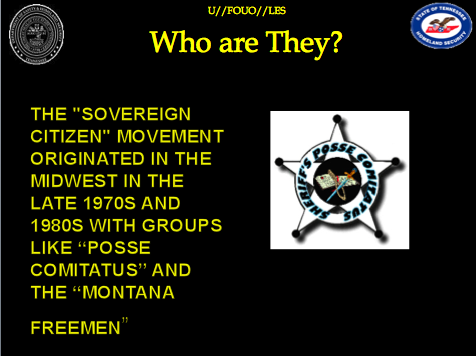 Slide #10: This is an example of someone who you would least suspect as a sovereign citizen. 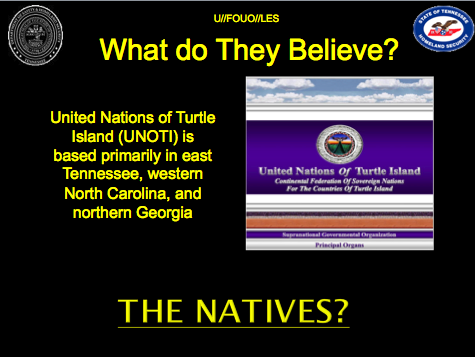 He was turned over to internal affairs by his co-workers who stated he began talking to them about sovereign ideology within the department and was distracted. 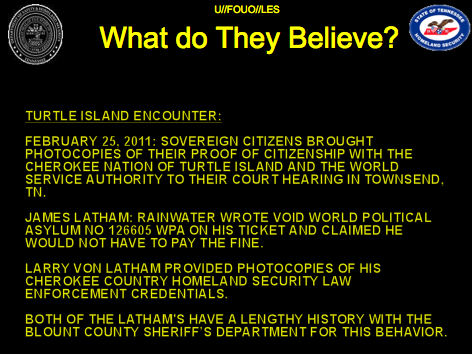 NOTE: Laughlin was introduced to sovereign ideology by his brother. 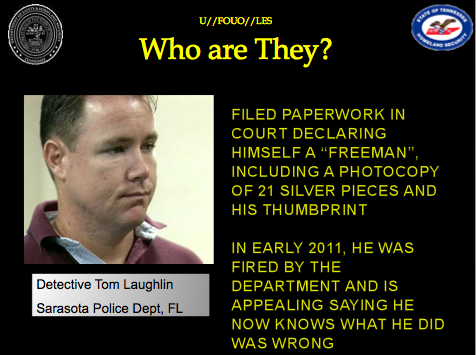 Officers should be aware a person like Laughlin could be feeding Law Enforcement Intelligence to other sovereigns about cases. 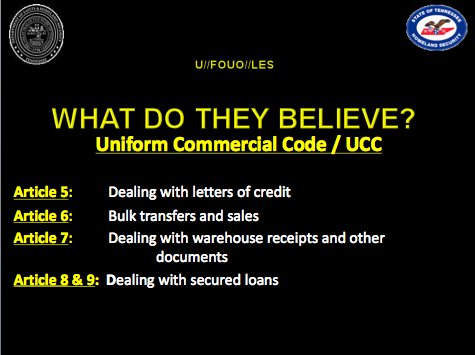 Slide #11: Financial troubles seem to proceed the step towards persons embracing sovereign ideologies. 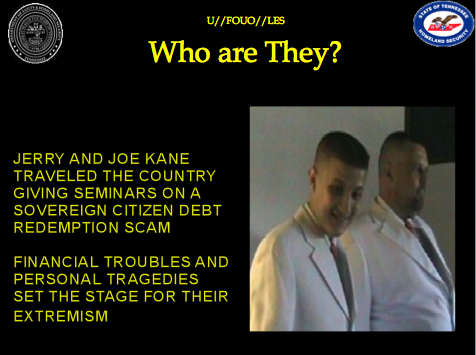 They have a hard time blaming themselves and will focus on the federal government as a source of their problems. 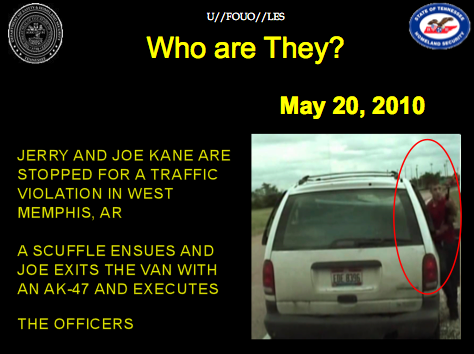 Slide #12: As you can see on the right side, Joe Kane is exiting the van with his AK-47. 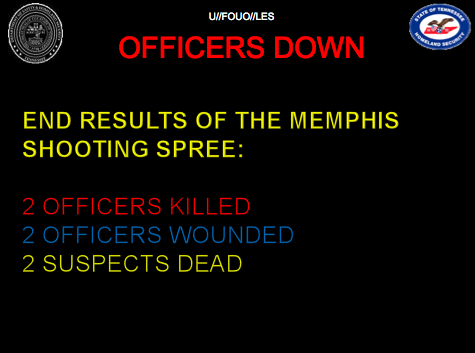 This is the last site the officers saw before they were gunned down. 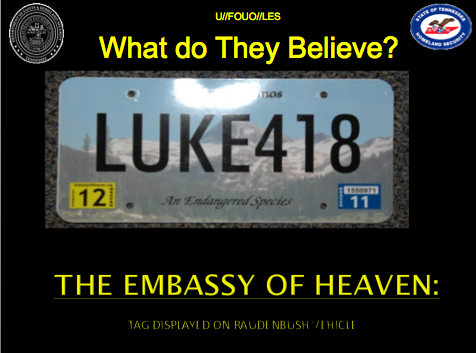 While some sovereigns will use fraudulent plates, KANE used a legitimate plate that was registered to the church, “House of God’s Prayer” in New Vienna, Ohio. A previous owner of this property was Harold Ray Redfearin a one time leader of the Aryan Nations and successor of Richard Butler. 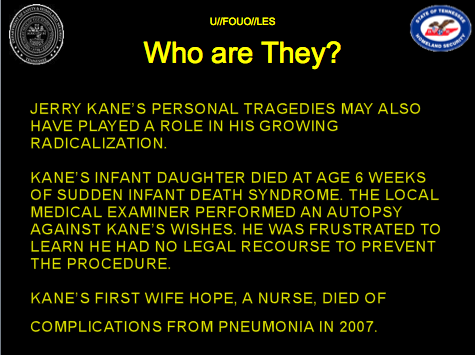 The connection to KANE has not been established or been made available at this time. 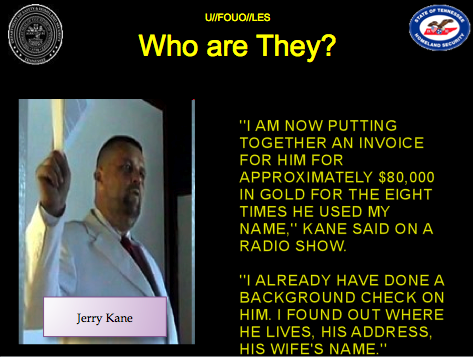 Slide #14: Jerry Kane was jailed for three days before posting a $1,500.00 bond. 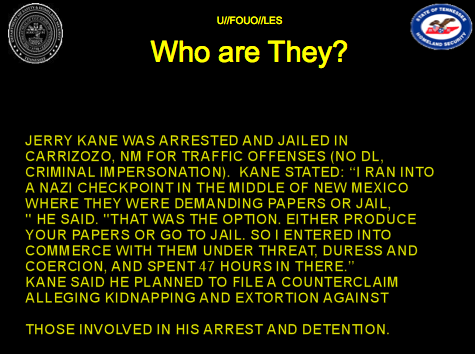 Kane also said he had an officer sign a document that said the officer must pay for using Kane’s name. 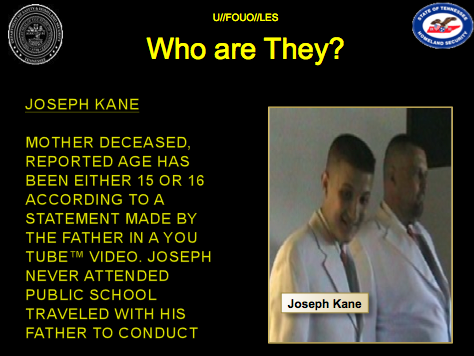 Slide #17: Father and son alleged in open source reporting to travel with the mother’s ashes. This is Dependent on media outlet. 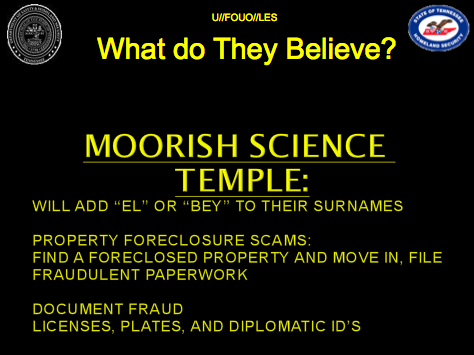 Slide #19: The Sovereign Belief SystemThe contemporary sovereign belief system is based on a decades-old conspiracy theory. 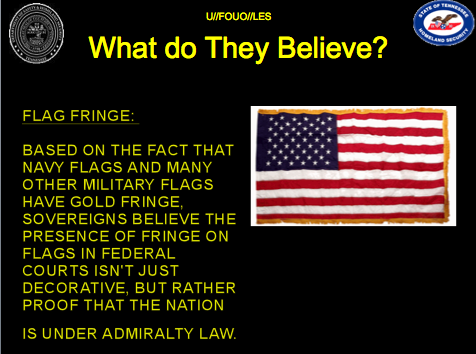 At some point in history, sovereigns believe, the American government set up by the founding fathers — with a legal system the sovereigns refer to as “common law” — was secretly replaced by a new government system based on admiralty law, the law of the sea and international commerce. 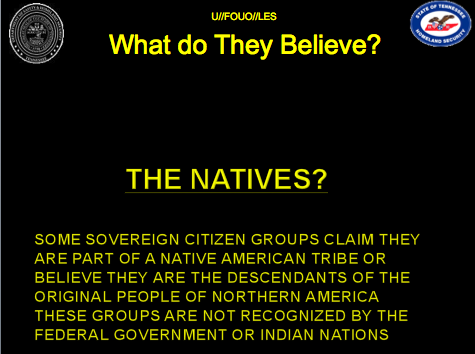 Under common law, or so they believe, the sovereigns would be free men. 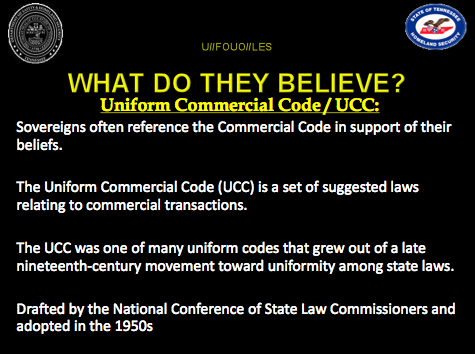 Under admiralty law, they are slaves, and secret government forces have a vested interest in keeping them that way. Some sovereigns believe this perfidious change occurred during the Civil War, while others blame the events of 1933, when the U.S. abandoned the gold standard. 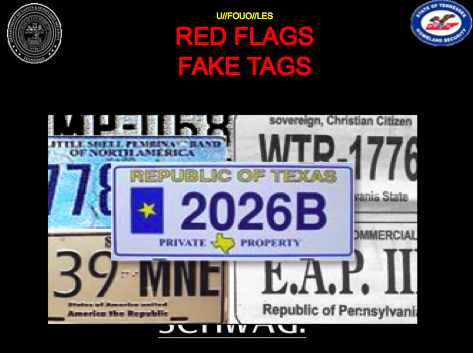 Either way, they stake their lives and livelihoods on the idea that judges around the country know all about this hidden government takeover but are denying the sovereigns’ motions and filings out of treasonous loyalty to hidden and malevolent government forces. Though this all sounds bizarre, the next layer of the argument becomes even more implausible. Since 1933, the U.S. dollar has been backed not by gold, but by the “full faith and credit” of the U.S. government (in fact, President Franklin D. Roosevelt ended private ownership of gold in large amounts in 1933; governments could still sell gold for dollars to the U.S. Treasury for a fixed amount after that, until that practice was ended by President Richard Nixon in 1971). 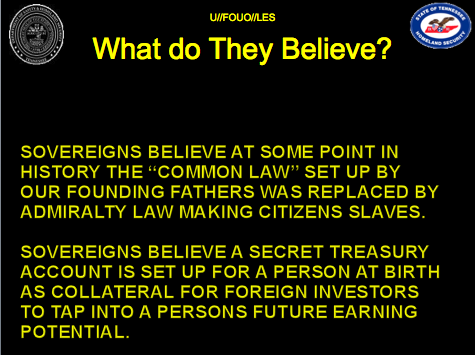 According to sovereign “researchers,” this means that the government has pledged its citizenry as collateral, by selling their future earning capabilities to foreign investors, effectively enslaving all Americans. This sale, they claim, takes place at birth. When a baby is born in the U.S., a birth certificate is issued, and the hospital usually requires that the parents apply for a Social Security number at that time. 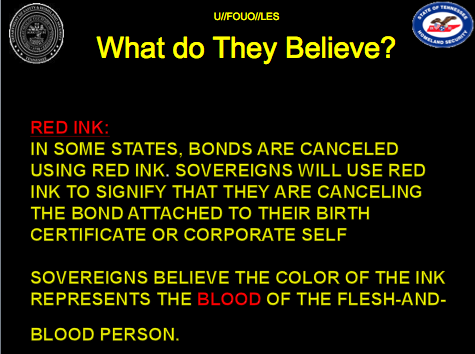 Sovereigns say that the government then uses that birth certificate to set up a kind of corporate trust in the baby’s name — a secret Treasury account — which it funds with an amount ranging from $600,000 to $20 million, depending on the particular variant of the sovereign belief system. By setting up this account, every newborn’s rights are cleverly split between those held by the flesh-and-blood baby and the ones assigned to his or her corporate shell account. 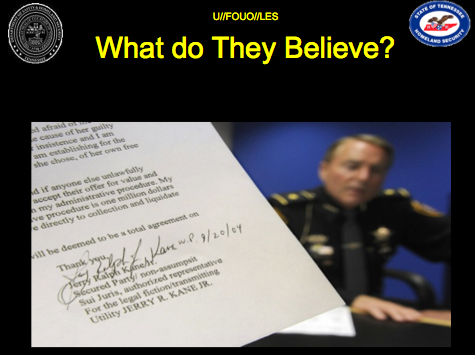 Slide #22: On February 4, 2011, Knox County Sheriff “JJ” Jones, Governor Haslam, and the Tennessee Secretary of State received a letter from Terry Lee: Davidson (aka DAVISON) declaring his sovereignty and right to travel the state without interference. 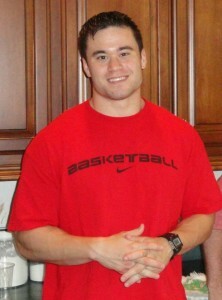 FBI JTTF task force officers attempted to make contact with Davison but were unsuccessful. 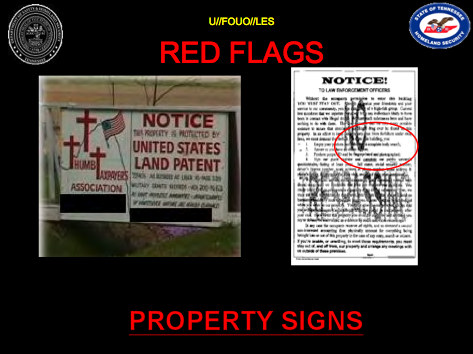 Davison had a sign at his gated property claiming there was a financial penalty for trespassing on his property. 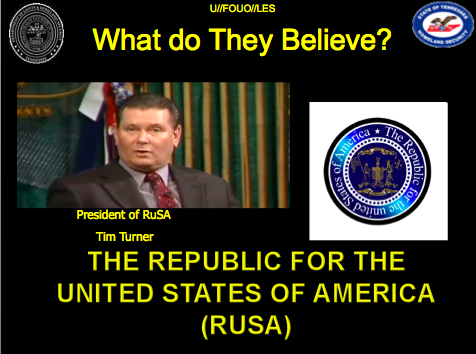 Slide #24: Tim Turner was one of the leaders of the Guardians of the free Republics. 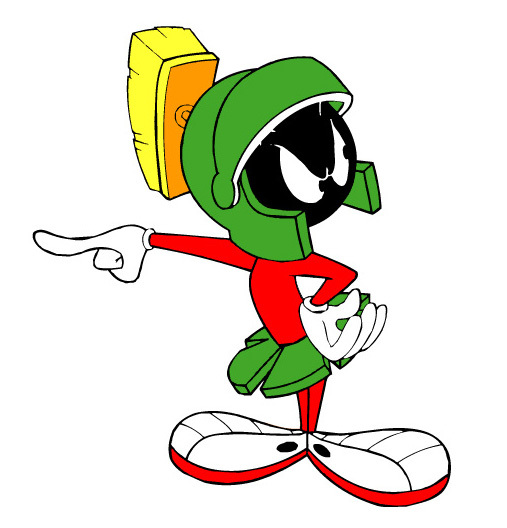 He separated and formed RuSA, becoming its president. 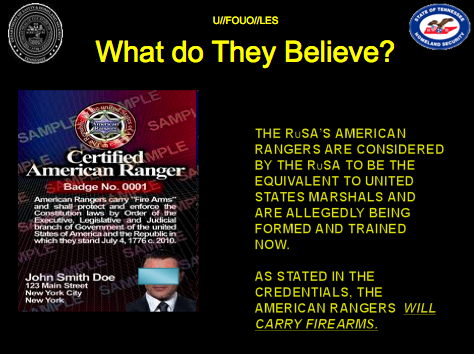 Slide #25: Waivers are given to “adequately trained” RuSA members who have military or law enforcement training. 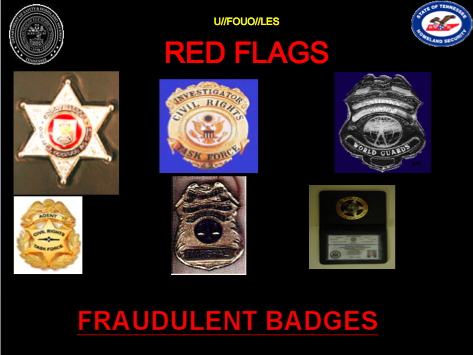 It is believed some American Rangers are armed and already carrying these credentials. 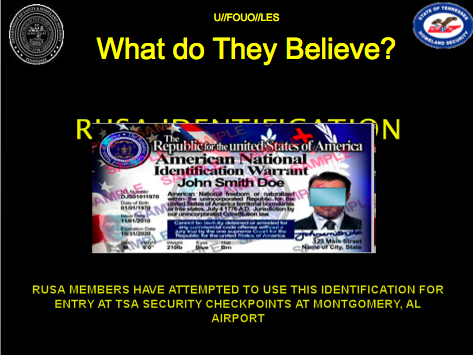 Slide #26: Jan 2011 – Based on information obtained from the Transportation Security Administration (TSA), three identified members of the sovereign citizen group, Republic for the united States of America (RuSA), presented false identification documents in an attempt to pass through a security checkpoint at the Montgomery, Alabama, airport. 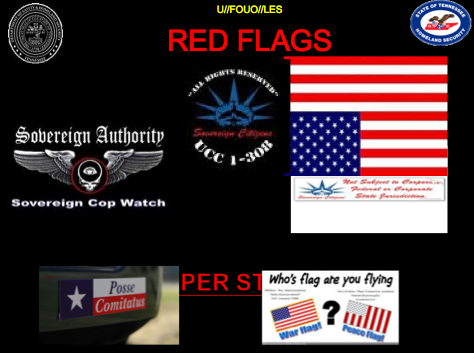 The individuals attempted to utilize self-produced “Alabama Travel Warrant” and “Republic for the united States of America Diplomatic Agent” identification cards to pass through security. 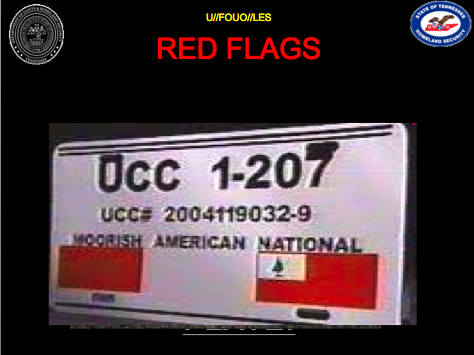 Each document displayed a photograph, identification number, date of birth, and an expiration date similar to a driver’s license. 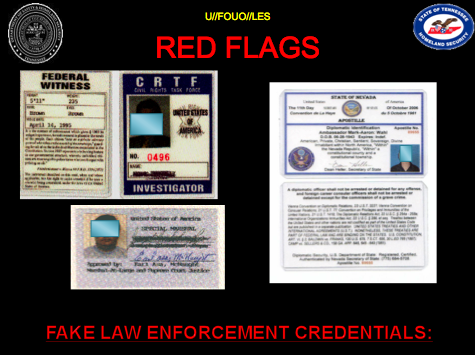 RuSA officials have publicly encouraged members to use credentials issued by the group in lieu of government-issued identification. 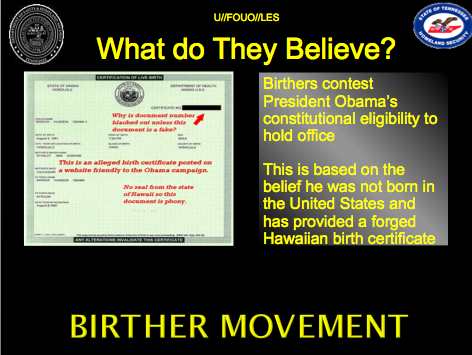 Slide #27: This movement came to the spotlight when Donald Trump publicly asked President Obama to release his long form birth certificate. Even with this release, the “birthers” still believe this is fraudulent and will point to inconsistencies as proof of their claim. While Trump was still considering running for office, the birthers rallied behind him. 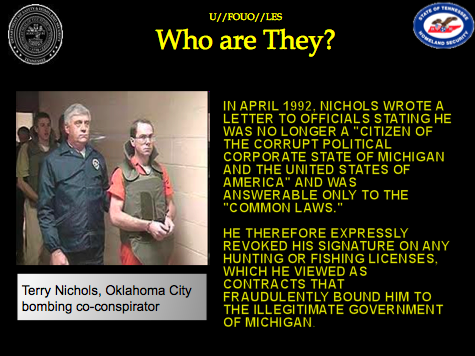 Slide #28: East TN’s local superstar continues to call the Knoxville FBI office, US Attorney’s Office, and is relentless in his fight against perceived corruption. 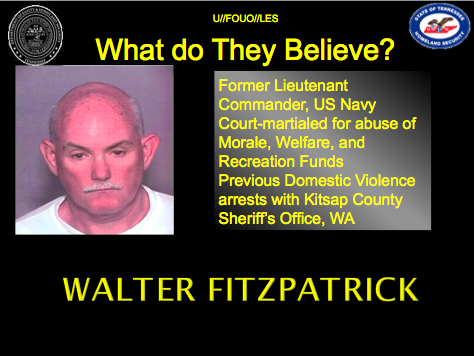 Slide #29: Fitzpatrick claims President Obama is guilty of treason because he lied to the American people and assumed office even though he was not a natural born citizen. 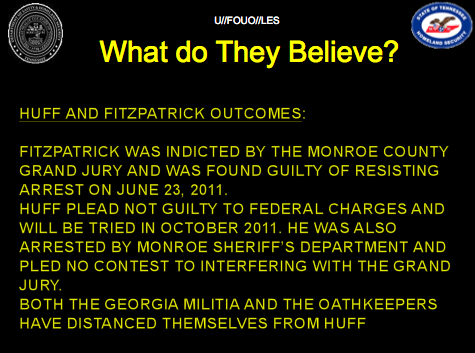 Since then he has changed his focus to uncovering the corruption in Monroe County. 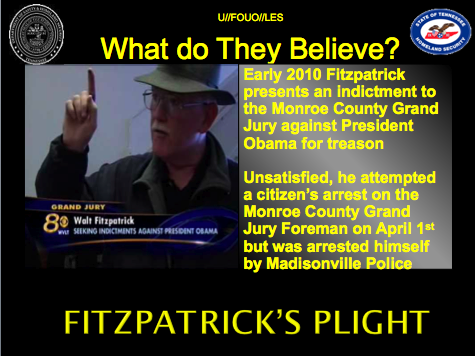 Fitzpatrick believes the Grand Jury Foreman has exceeded his term limits and is determined to bring this to light for prosecution. He continues to blame the courts, TBI, and the FBI for ignoring this corruption and accuses the officers of dereliction of duty. 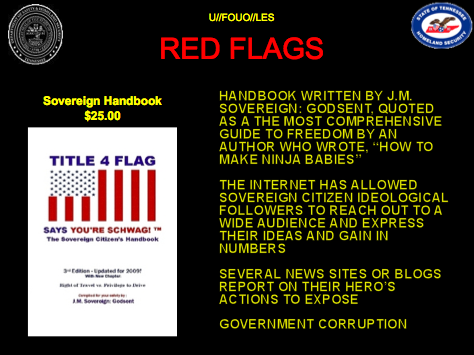 He is repeatedly interviewed by an on-line newspaper called the Post and Email and appears on on-line radio shows. 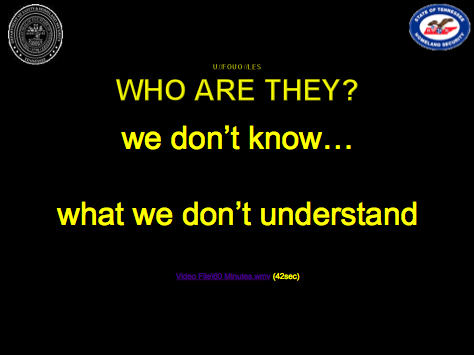 Slide #31: JAG HUNTER comment – Mr. Huff did not speak these words. 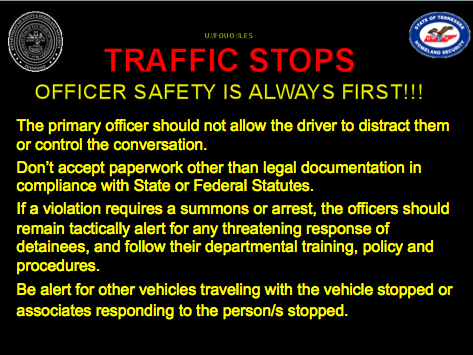 No one overhead Darren make the statement presented in this slide. 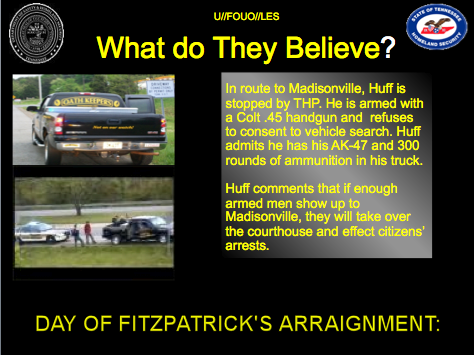 Mr. Huff never spoke the words. 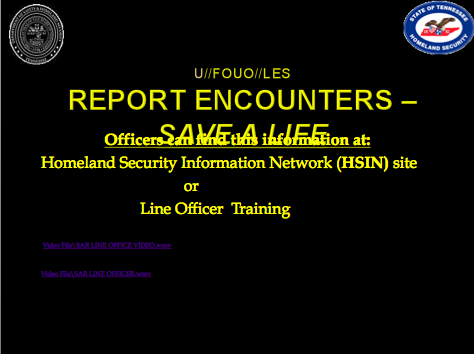 This is nothing more than an Justice Department FUSION CENTER disinformation campaign! 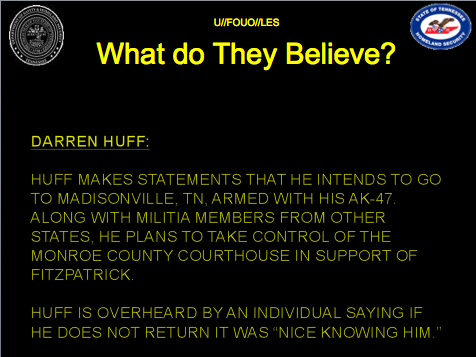 Slide #32: JAG HUNTER comment – Mr. Huff did not–I SAY AGAIN–Darren did not speak these words! 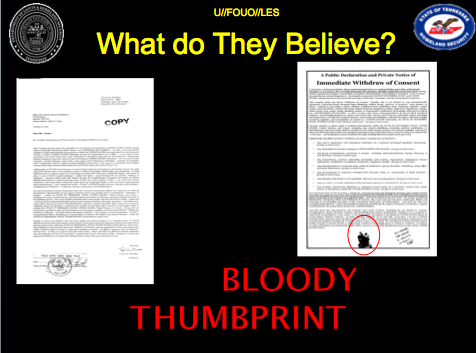 The FBI and their FUSION CENTER partners are lying! 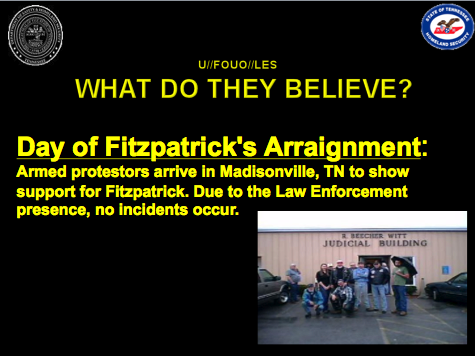 Slide #33: JAG HUNTER comment – The FBI along with their “FUSION BUDDY” partners report that these folks were carrying guns. 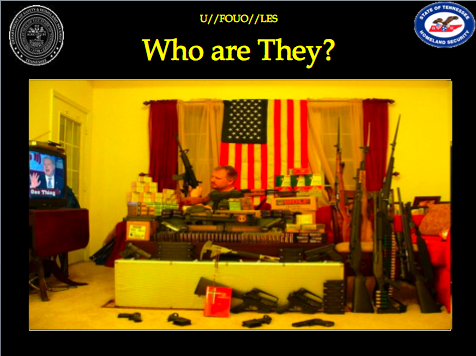 NONE OF THESE FOLKS WAS CARRYING A GUN! They were carrying raincoats and umbrellas! 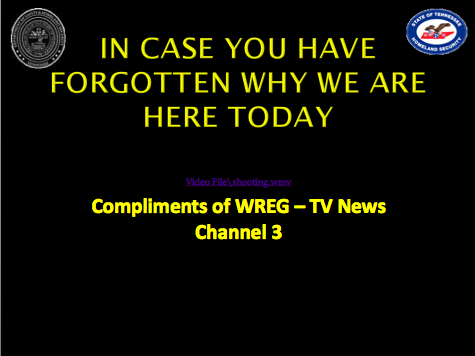 CLICK HERE: WREG video no longer available on YouTube. 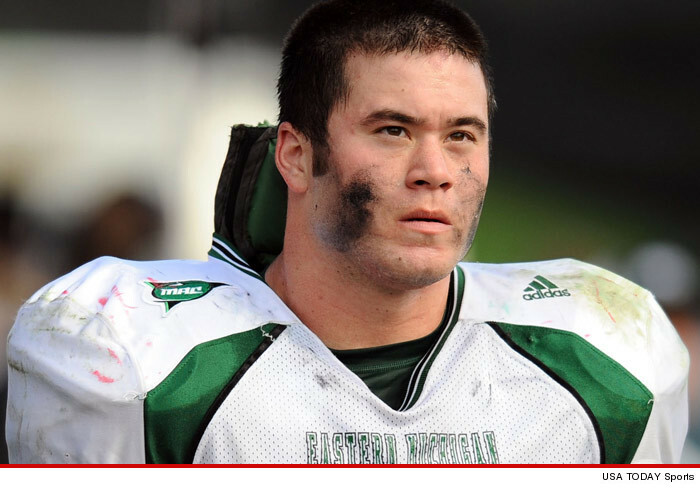 This CNN piece is used instead. 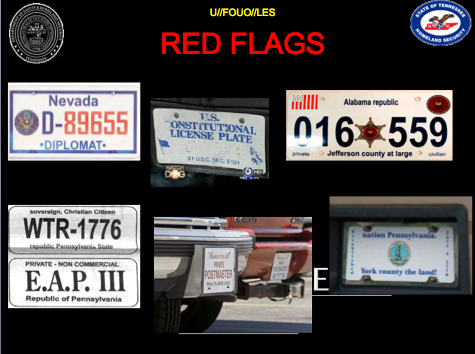 Slide #42: The subject asked the trooper if he was going to give him grief over his license plate. 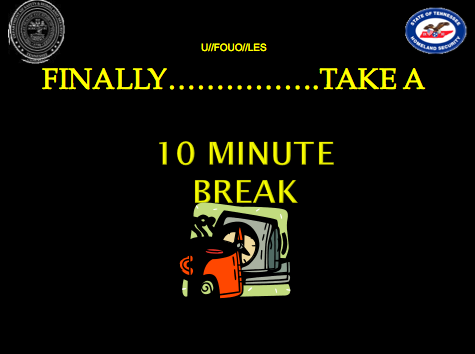 The trooper replied no, and was able to obtain personal information from both subjects on a Vehicle Tow-In Report in a show of good faith. This intelligence became useful in identifying the subject. 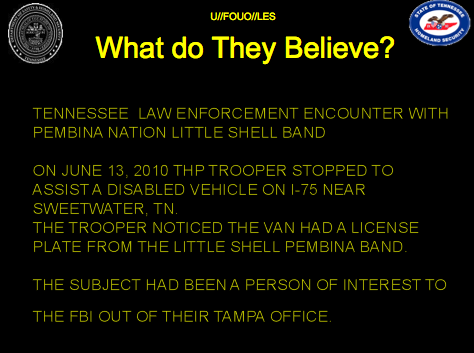 Analyst Research discovered: The subject’s former spouse informed FBI agents that he has become increasingly anti-government and has made claims that, “If police tried to get him, he would take out as many as he could.” The subject has ties with the Little Shell Pembina Band, monitors the “We the People” website, and was known to have a .50 cal sniper rifle and fully automatic AK-47’s. 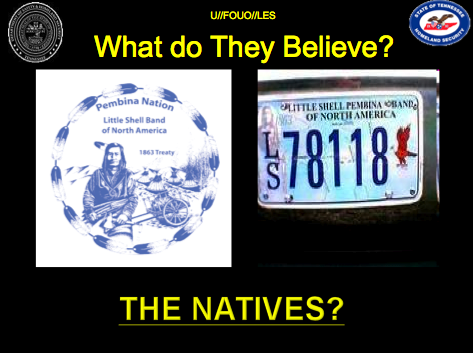 Slide #43: United Nations Of Turtle Island has been creating bogus license plates, driver’s licenses and similar documents since around 2003. 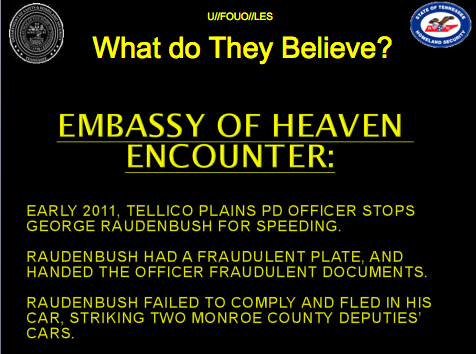 Raudenbush has ties to Fitzpatrick in Monroe County and has a criminal history. 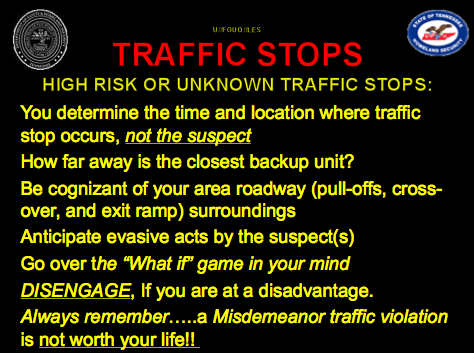 Slide #50: Identification provided to officer at time of traffic stop. 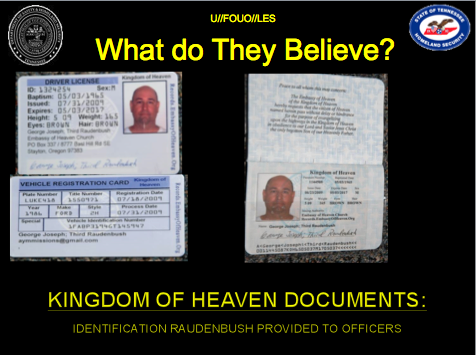 Raudenbush supposedly runs a children’s youth mission teaching them how to become missionaries. According to local officers in Tellico Plains, Raudenbush has been sued by MATTEL toy company over the unauthorized use of their American Girl dolls name. Raudenbush was photographing little girls promising that they would be models for the dolls. 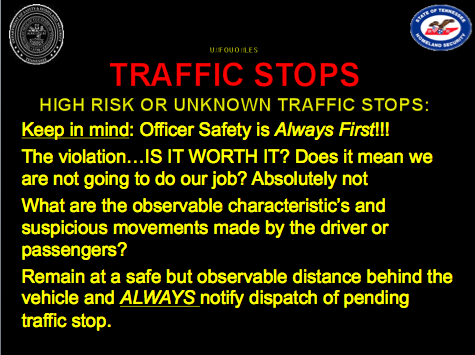 Slide #57: Indicators to be alert for when conducting traffic stops. 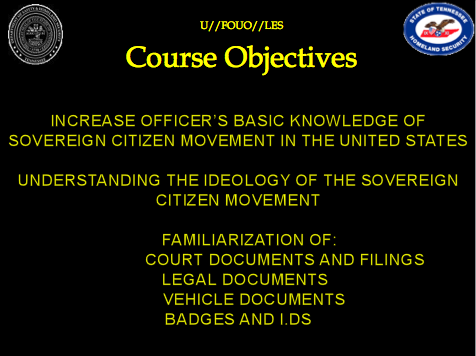 by a self-proclaimed sovereign citizen. 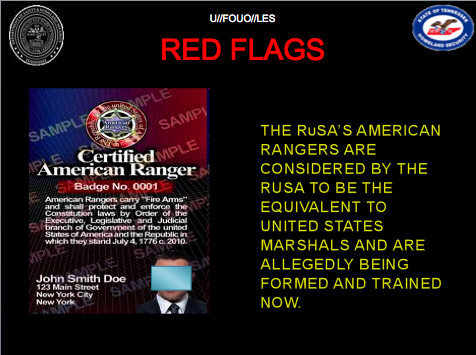 Slide #62: Waivers are given to “adequately trained” RuSA members who have military or law enforcement training. 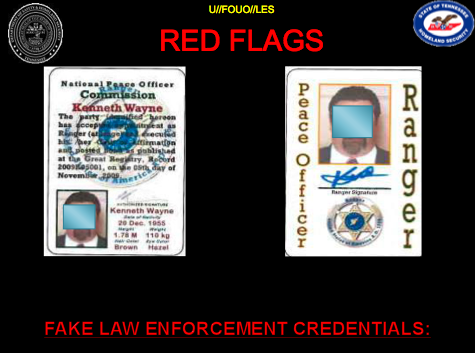 It is believed some American Rangers are armed and already carrying these credentials. 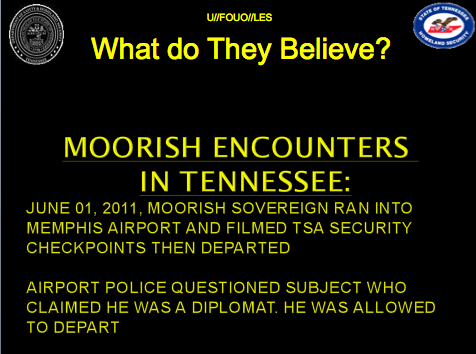 Slide #63: Jan 2011 – Based on information obtained from the Transportation Security Administration (TSA), three identified members of the sovereign citizen group, Republic for the united States of America (RuSA), presented false identification documents in an attempt to pass through a security checkpoint at the Montgomery, Alabama, airport. 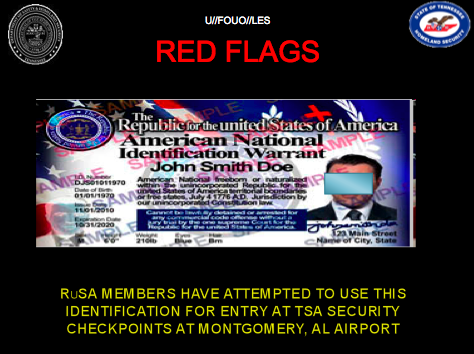 The individuals attempted to utilize self-produced “Alabama Travel Warrant” and “Republic for the united States of America Diplomatic Agent” identification cards to pass through security. 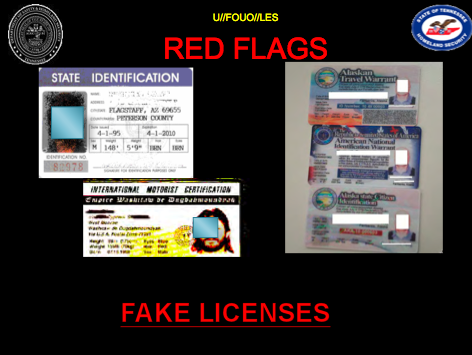 Each document displayed a photograph, identification number, date of birth, and an expiration date similar to a driver’s license. 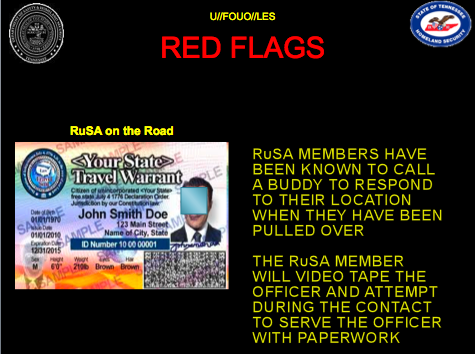 RuSA officials have publicly encouraged members to use credentials issued by the group in lieu of government-issued identification. 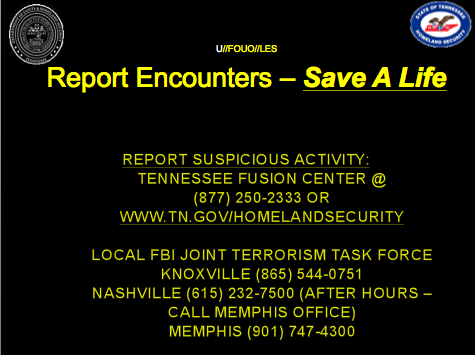 Slide #73: Emphasis reporting to the local FBI JTTF when the incident or behaviors involve exigent circumstances or active violence. 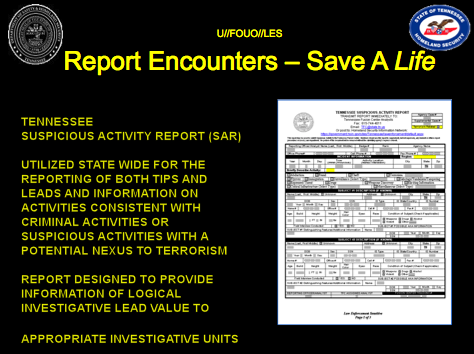 Examples; active shooter, bank robbery, executed search warrant revealing threat information. 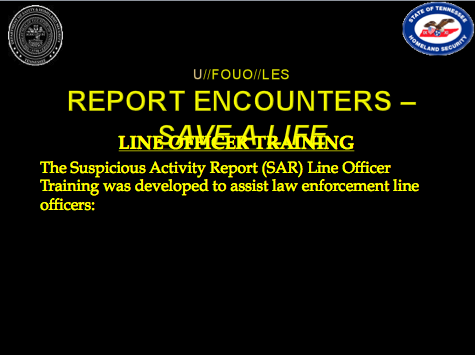 Emphasis following up with a report to the TFC following JTTF notification.